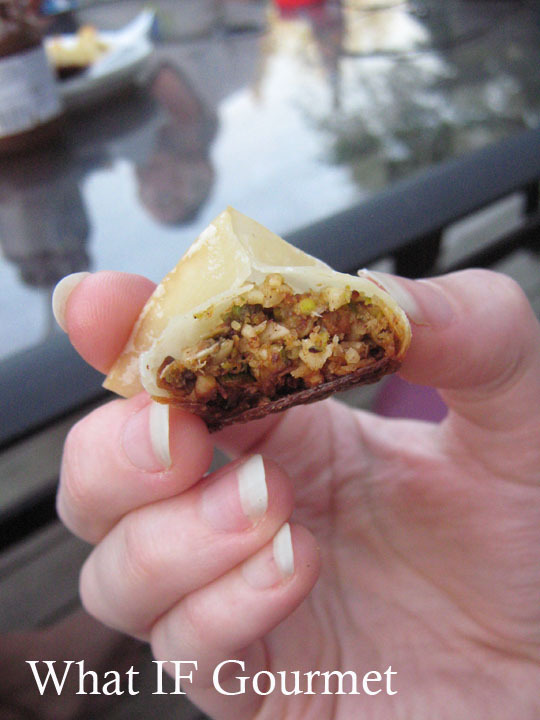 These bitty baklava bites please the eye as well as the palate, an important duality when it comes to dessert satisfaction. 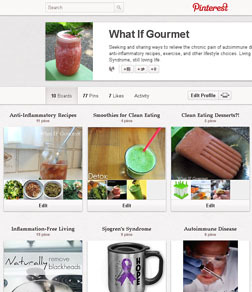 I know, I know: when your body is fighting autoimmune inflammation, sugar is the enemy. However, sometimes the psychological benefit of dessert can outweigh modest sugar content, particularly when other, more healthful ingredients are involved. The saturated fat in coconut oil is generally accepted to be less inflammatory than that in butter; recent studies show it actually promotes heart health and may help burn fat. 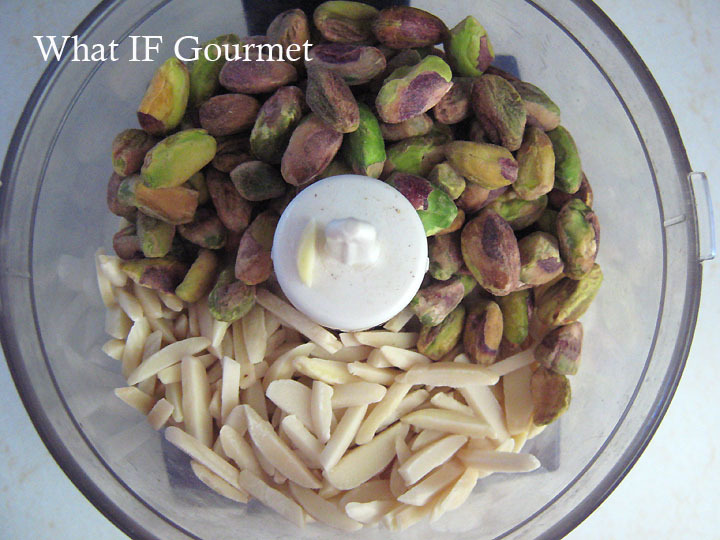 Nuts like almonds and pistachios contain anti-inflammatory omega-3 fatty acids. Spices also contain anti-inflammatory compounds. And honey, while admittedly still a sugar, offers nutriceutical benefits that refined sugar does not. Use any honey you like in this recipe. I used Russian buckwheat honey because I love its strong, deep flavor. One serving of this dessert (3 baklava bites) contains less than 1 tsp honey, which is roughly equivalent to 4 grams of added sugar. Makes about 2 dozen baklava bites (8 servings of 3 bites each). Preheat oven to 325 F. Line a cookie sheet with foil. 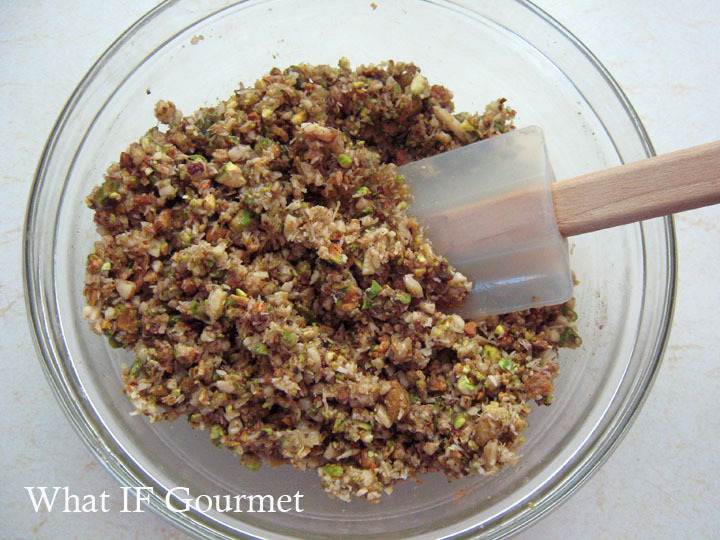 Chop the nuts in a food processor until finely minced. 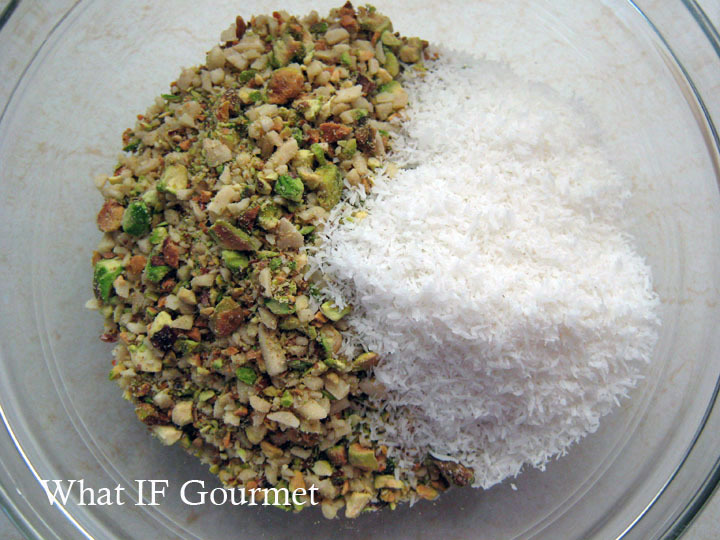 Add the nuts to the other dry ingredients in a small bowl and toss to combine. Stir in just enough honey to moisten the mixture. 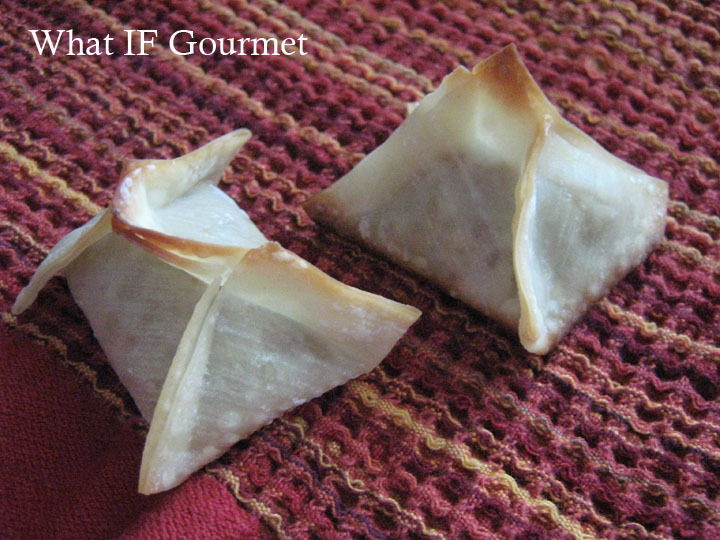 Lay out a wonton wrapper on a flat surface. 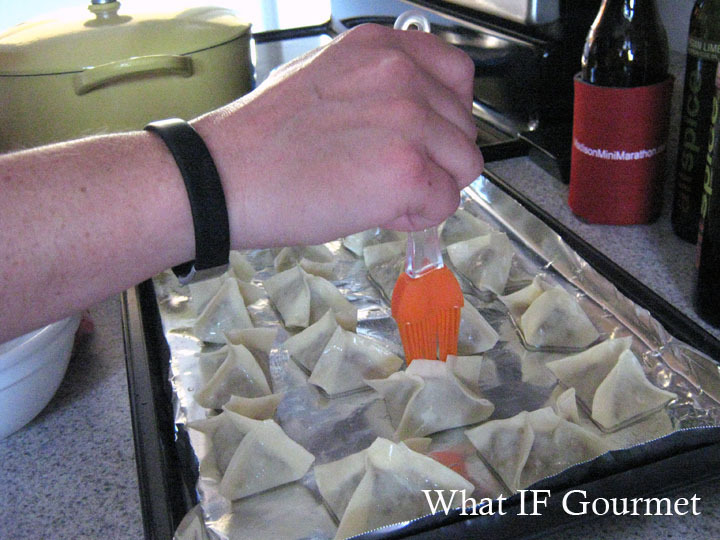 Dipping a finger into a bowl of water, moisten all four edges of the wonton wrapper. 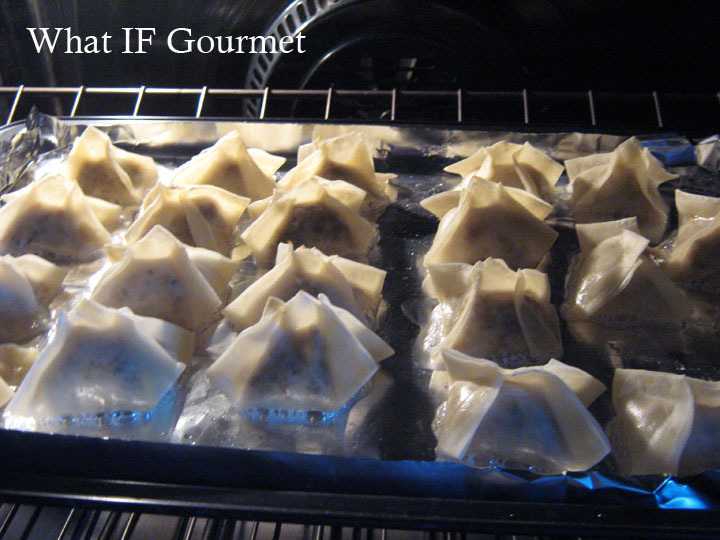 I fill the wonton wrappers and pinch them closed, trying to squeeze out as much air as possible. 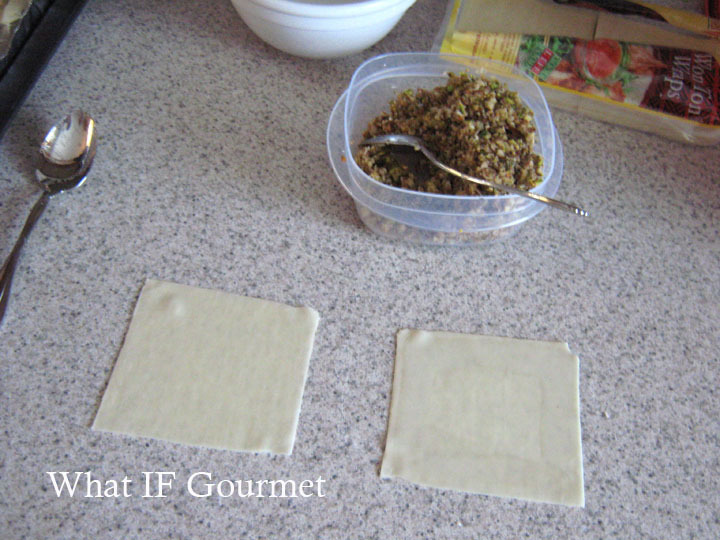 Bring two opposite corners of the wonton wrapper up to meet over the filling, and pinch together. Then bring up the other two corners and pinch the seams shut. Kecia brushes the bites with melted coconut oil. 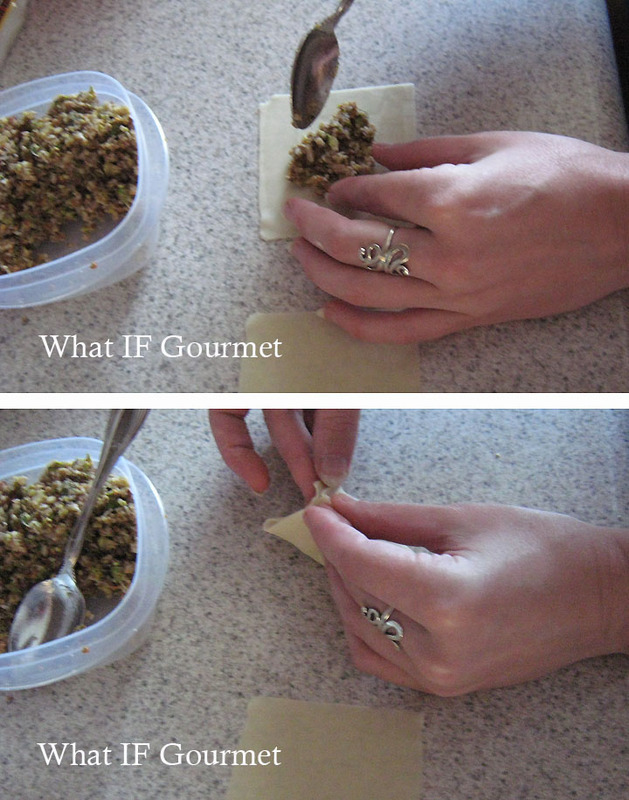 Place the baklava bites on a foil-lined cookie sheet and brush lightly with melted coconut oil. Bake for 10-15 minutes, watching carefully to avoid burning. When the bites start to turn golden brown at the edges and their bottoms are browned, remove from the oven and cool on a paper towel lined plate. Serve slightly warm or at room temperature. 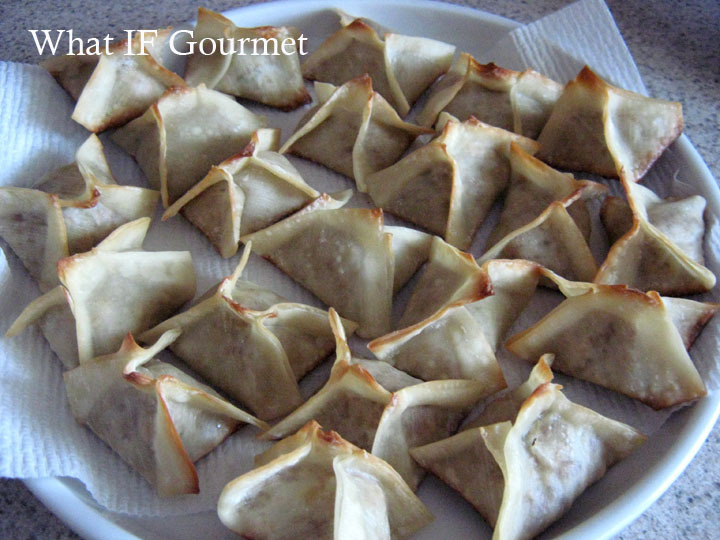 This entry was posted in Anti-Inflammatory Ingredients, coconut oil (virgin/ unrefined), Dairy-free, nuts, Recipes, spices, Vegetarian and tagged almonds, cardamom, cinnamon, coconut, honey, pistachios, wonton wrappers. Bookmark the permalink. (Quick note from the nutrition guy) Actually, research is showing that saturated fats in butter don’t cause trouble either, or saturated fats in general. It appears that the link between saturated fat and disease happened because people who eat lots of saturated fats eat lots of other scary things, too. That’s one of the final results out of looking at the French paradox, since the French eat TONS of butter but have low heart disease rates. So, in the inimitable words of Chef Point, “Beurre! Donnez-moi du beurre! Toujours du beurre! Hey, that’s good news! Can you point me to any articles to read up on these new studies? Also, I’m concerned that even if saturated fats are not the harbingers of doom they were once believed to be, they still might contribute to inflammation, which is my problem. Sugar in moderation is o.k. for most people, too, but for me, because I have an inflammation illness, I can tolerate much less than the average person. In terms of inflammation, it’s more complicated and I’m not an expert in autoimmune issues and diet. I know that in terms of coronary inflammation trans fat > carbohydrates > sat fat > unsat fat, but how this applies to whole-body issues I don’t know (at least not without reviewing the literature). The biochemistry is insanely complex (as I’m sure you well know already) because increased precursors of inflammation (omega-3 and omega-6 pufas) would seem to be pro-inflammatory (more material in the arachidonic acid pathway) turn out to be anti-inflammatory, and anti-inflammatory species (anti-oxidants) can become, paradoxically, pro-inflammatory. So the short answer is I don’t know, but the state of the science isn’t that much better…. I kind of figured that might be you — thanks for the confirmation. 🙂 As a lay person reading up on nutrition and the latest scientific studies, I find the information out there to be frustratingly contradictory. I just keep reading and making educated guesses, and experimenting with what works for my body. (I’m better at diagnosing and treating books — the organic chemistry for inanimate objects is much simpler!) I will continue to appreciate any suggestions and reading you send my way. And thanks for reading/commenting on my blog! It’s kind of tough, even for us. One way to think about it is that science and the media are on two different wavelengths. Science communicates as if each paper is a piece of a puzzle (one that we don’t have the box-top to guide us). Media has to report everything as an IMPORTANT DISCOVERY that is infallible. Think of each scientific paper you read as a comment in a discussion (and up for debate and allowed to be falsified) and each media proclamation as a carnival barker and you’re not far off. Review papers like the one I sent you are essentially a wiki entry summarizing the current discussion, so good as a guide to what to look for next and where to find it, but still not a voice from the mountaintop. In science it’s ok for stuff to be contradictory (think the whole thesis-antithesis-synthesis progression of dialectic) because it’s how we think, questioning each finding along with conventional wisdom. It does, though, make lay consumption of what we do so problematic. That’s why translational research and translational medicine is so big right now… it’s an attempt to get our work out of the lab and into the medical office, without losing anything in the translation. As for the carnival barkers, that is exactly how I feel about most proponents of the latest diet fad. (Hmm.. the “paleo” craze comes to mind…) I think a lot of these approaches to a healthy diet consist of some elements that are sound, but it’s the sensational and definitive way they are packaged that turns me off — I don’t trust anyone making a ton of money off of one, restrictive approach with (necessarily) contradictory scientific studies supposedly bolstering their claims. And I’m not sure I’m convinced by a one-size-fits-all approach to nutrition, anyway, especially given that different people have different genetic predispositions, or different illnesses, or different metabolisms, etc. I hope we’ll get the chance to continue this discussion in person some time!